Ah, Christmas... It's a time to reflect on the past; it's a time to look to the future (it's only just begun, after all); but let's be honest, most of all it's a time to unwrap presents. Bloody Hell, that's a corny intro. I'll be expecting a visit from Krampus after that. There's no avoiding it. Regardless of how much we might want Christmas to be about peace on Earth, goodwill to all, and holding hands around the tree to sing, "Welcome Christmas, Ba-hoo Bo-ray," the reason for the season seems to be predominantly about opening gifts and being vaguely disappointed with what's inside. 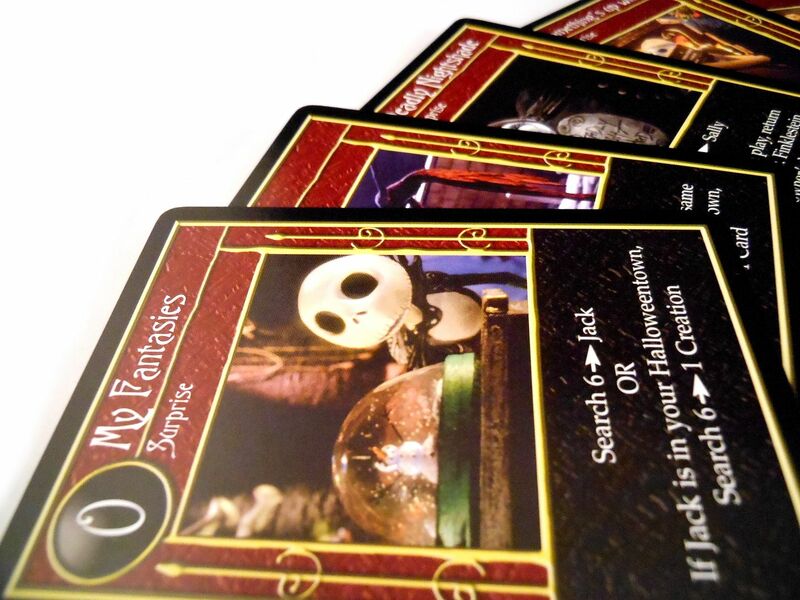 So, bearing that in mind, I thought I'd review Tim Burton's The Nightmare Before Christmas Trading Card Game, which from now on I'm going to refer to as NBX, because I'm down with the cool kids (and have RSI). My introduction for this review, it must be said, is slightly misleading. It makes it sound like I enjoy neither Christmas nor NBX, but nothing could be further from the truth. Christmas is absolutely my favourite time of the year, not least because it's the only time of the year when you don't mind a home intruder leaving a little present in your socks. When I was a kid, my favourite Christmas story was How The Grinch Stole Christmas. There was something magical about the story of a bitter and twisted creature trying to ruin everyone's fun, but eventually coming to realise that Christmas doesn't come from a store. I still watch The Grinch every Christmas Eve. But in 1993, Touchstone Pictures released a movie that spoke to me. The story of Jack Skellington, and his ill-fated attempt to take over Christmas. As a huge fan of horror, animation, musicals, Halloween, and Christmas, NBX hit all the right notes (and not just those in Danny Elfman's bombastic score); and it's been my favourite movie ever since. In many ways it's similar to The Grinch, but it's so much darker. The Grinch wants to destroy Christmas; but Jack wants to own it in the most materialistic kind of way. The Grinch learns the true spirit of Christmas through seeing the strength of goodness in other people; Jack gets blown up with a missile, only seeing the error of his ways when he discovers how far humans will go to stop his nighttime terrors. Ultimately, The Grinch corrects his own mistakes; Jack defers to Santa in his utter defeat. Perhaps the most surprising thing of all is, in his defeat, Jack achieves what the Grinch couldn't. He successfully takes Christmas from the people, and he completely subverts it. As soon as he takes away Santa, the humans' Christmas cheer evaporates. They don't sing songs around the Christmas tree; they roll out the military. They revert to their base, destructive, stock response to any perceived threat. Jack reveals how thin the Christmas veneer is. Behind the gifts, the twinkly lights, and the carols, the world is just as broken as it's always been. Humanity is always just one button press away from mutual destruction. And does blowing up Jack save Christmas? The missiles blow holes through the holiday, leaving everything in tatters and creating a void in the hearts of those who witnessed it. Who, then, truly destroys Christmas? And sure, the movie ends all warm and fuzzy, and fills you with Christmas cheer; but you can say the same thing about It's A Wonderful Life, a feel-good movie about a man who tries to kill himself. These films shine a spotlight on why Christmas is so important, and also so dangerous. They remind us why, once a year, we drown ourselves in Christmas spirits. Sometimes the only way to silence the gunfire is to sing louder. I'm sorry if this introduction has become tiresome, but I felt it was important to talk a little about how much I love this film. I have watched it at least twice every year since it's release (once at Halloween, once on Christmas Eve, and any number of times inbetween), and it has become my daughter's favourite film too. Considering that, it's unsurprising that I'm always looking for new ways to explore its themes, even if those experiences involve elements that I loathe, such as blind packaging. And that's why I have a copy of the NBX Trading Card Game. Back in the day (I won't tell you which one), I used to play Magic: The Gathering. I loved the game, but I hated the hunt for particular cards. Years later, I started trying to collect and play the Aliens vs. 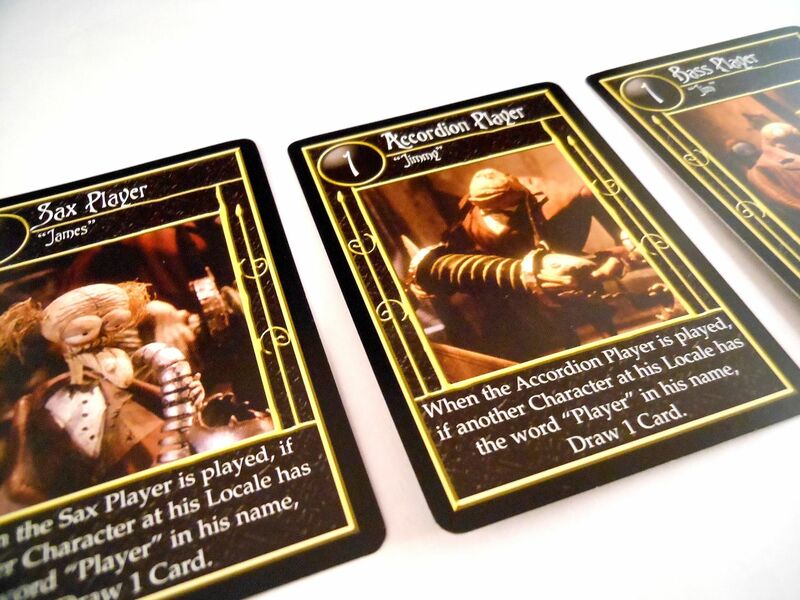 Predator card game. I gave up after spending a small fortune without finding a single one of the main characters from the film, or any of the decent weaponry. There's only so many times "unnamed grunt" with "pistol" can face off against the xenomorph hordes. I've never played a collectible card game since then. This year, I finally decided that my love of NBX truly outweighed my hatred for the collectible card game format, so I bought a box of 12 starter decks from an American seller on eBay. 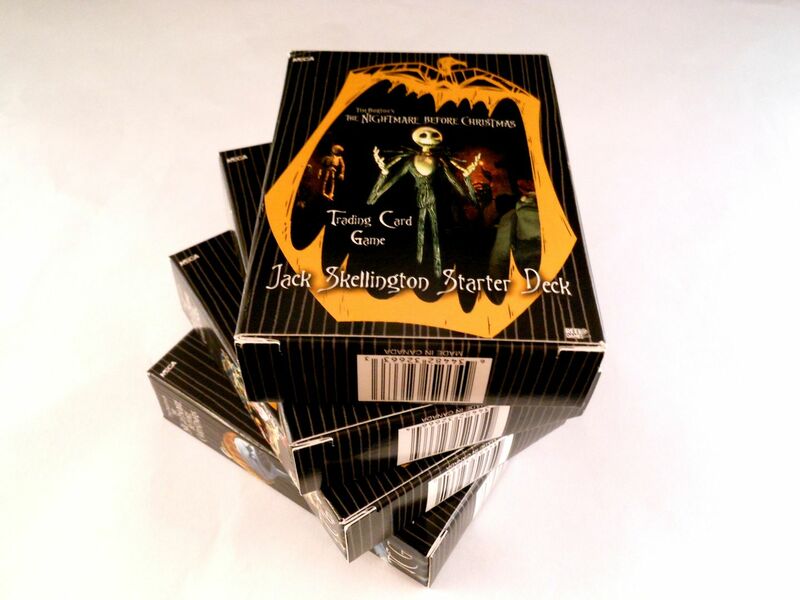 Buying 12 boxes may seem odd, but this game actually has four different starter decks, themed around the four main characters of Jack Skellington, Oogie Boogie, Dr. Finklestein, and The Mayor, and buying a box containing three of each starter set worked out significantly cheaper than trying to buy a set of four from elsewhere. Additionally (and rather unusually), this game is for any number of players, so it's a good idea to have a few extra starter decks kicking around. On the first turn of the game (a full game is 12 rounds, representing the 12 days of Christmas), all players reveal their starting locales and then draw a starting hand as defined on the locale card. In subsequent rounds, all players simultaneously draw locales from their locale decks and place them in their towns. New locales must either be added to the left or right of any existing cards in the town. Next, the Pumpkin King selects a Pumpkin King activity. Each activity is free for certain players, while other players have the choice of using the activity by discarding a card. For example, the option to draw a card is free for the player with the least cards in hand. Obviously, the Pumpkin King wants to select an activity that he or she gets to use for free, or else pick an ability that hinders the other players in some way. 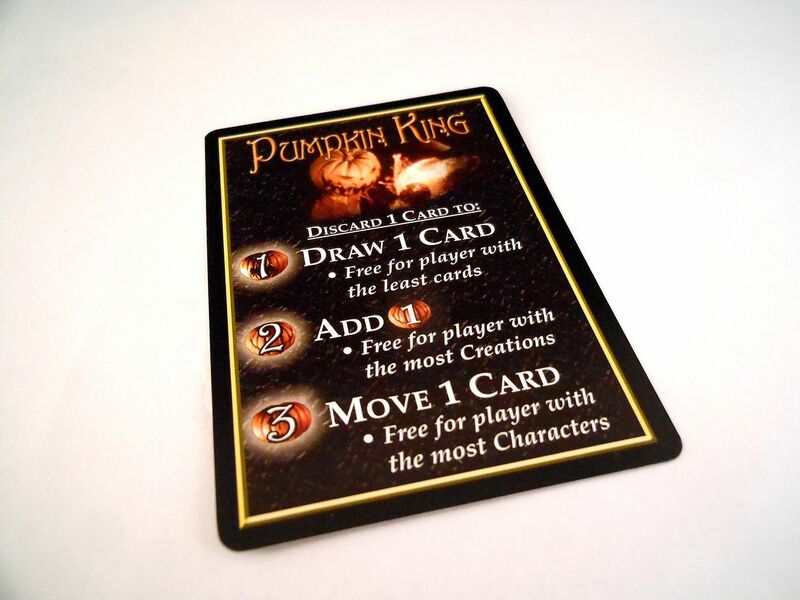 Then each player, starting with the Pumpkin King, takes a turn. These turns comprise performing one function on an active locale, and playing any number of cards. Players can play cards before or after a function. Now, this is where it gets clever: Every location has a Scare Threshold, printed in the top left of the card, and every character has a Scare Number. A locale is only active if the total of the Scare Numbers on all characters at that locale matches or exceeds the Threshold. The exception is the starting locale, which is always active, providing permanent access to a selection of low-powered functions. But, a character's Scare Number is also the cost to bring that character into play, and paying that cost requires pumpkin points. Where do pumpkin points come from? So, the game has a lovely sense of escalation. You start with no characters in play, which means you only have access to the basic functions on the starting locale. Those basic functions give you access to a couple of pumpkin points, which you can then use to purchase a character. That character allows you to active locales with more powerful functions, such as the ability to gain extra pumpkin points, which in turn allows you to purchase even more powerful characters. As the game progresses, your town grows, your population grows, and your options grow. One of the biggest challenges is getting your characters into the correct locales. If you want to activate your Graveyard with Jack, you first have to get Jack to the Graveyard, and that involves activating a location that grants the Move action. The Move action gives you a number of move points, and each point equates to moving any card to an adjacent town locale. So, with three move points, you could move one character three locales, or three characters one locale each. 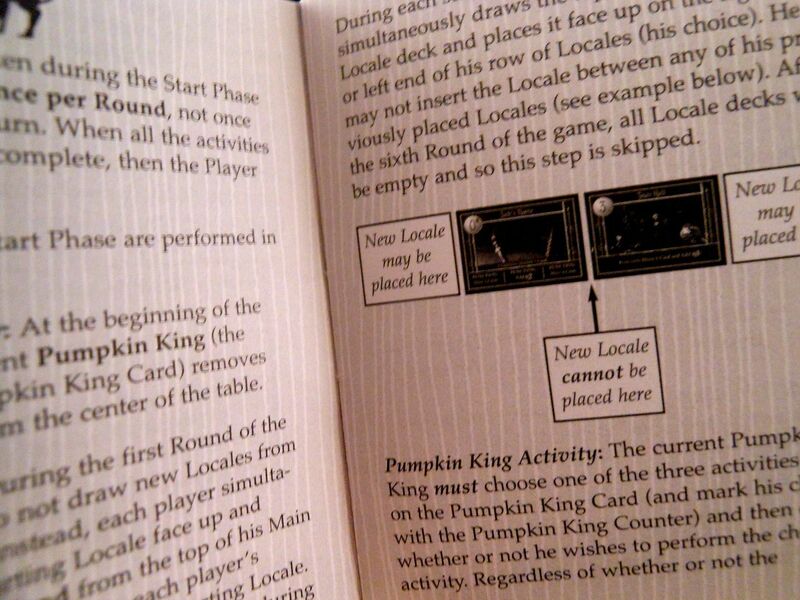 The problem is, if you use a function to acquire movement points, you aren't acquiring pumpkin points. If you aren't acquiring pumpkin points, you aren't buying characters; and if you aren't buying characters, you aren't working towards your end game: Making Christmas creations to hand out to all the kiddies on Christmas Eve. You pay for creations in the same way as you pay for characters (with pumpkin points) and once you've played them they don't do anything else for the rest of the game; but at the end of the game, they're worth big victory points. Effectively, you're buying victory points. Of course, that creates additional problems. If you use all your pumpkin points to bring a new creation into play, you're banking points, but you're giving up a turn when you could be bringing more useful characters into play. Worse still, your hand doesn't replenish at the end of the round. If you want more cards to play with, you have to activate a locale function that lets you draw some new cards. As the game progresses, you're constantly facing tough choices. And whichever activity you choose, you're giving up something equally important for keeping your Halloween Town ticking over. Each turn you're choosing between drawing cards, moving cards, paying to bring characters into play, or banking victory points; and finding the perfect balance is like spinning plates. In the end, it's all about efficiency, and you stay efficient through that classic trading card game mechanism: killer combos. Perhaps surprisingly, considering the theme of developing a town and then populating it to build Christmas presents, this isn't a game about creating an economic engine. It's a set collection game. You see, every character has a special ability: A way to manipulate the basic framework of the game to your advantage. 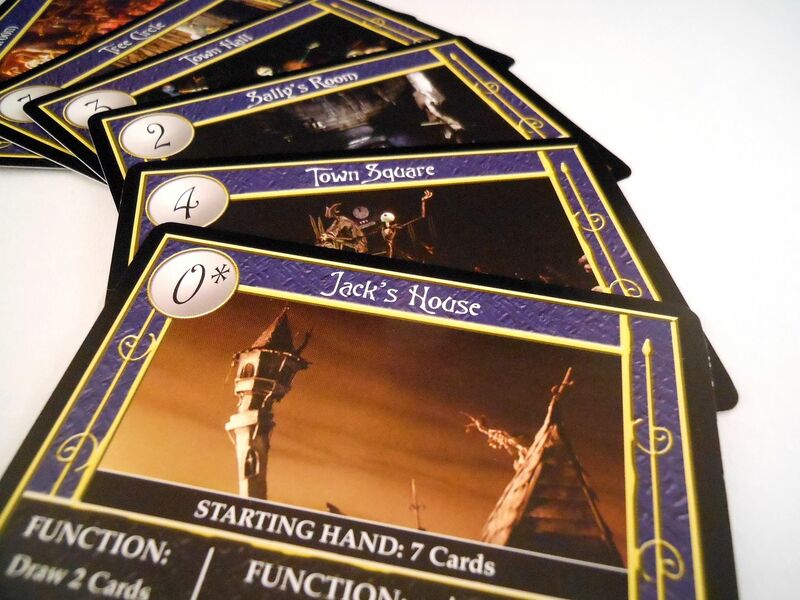 Jack costs one less pumpkin point if you play him at his house; Zero follows Jack whenever he moves; and the members of the band let you draw cards when you play them in the same location. Most importantly, many of the characters discount the cost of certain creations. For example, the Jingle Bells cards costs four pumpkin points, but if you have all three members of the band in your Halloween Town, it only costs one pumpkin point. This is where deck creation becomes a key consideration to your strategy. You can have multiples of characters and creations in your deck, which increases the likelihood of getting the combos you need, but you're only allowed one of each unique card in play. Take too many identical cards, and you're likely to end up with a lot you can't use. Take too few, and you need the stars to align to get the combos in play. It's just very, very clever. The final weapons in your arsenal are the surprise cards. These are the "gotcha" cards that give you the chance to screw over your opponents, or gain a one-off benefit to forward your own agenda. They don't cost any pumpkin points to play, but you can't play multiples of the same card in the same turn. Surprises are particularly good for getting your combos on the table, as many of them allow you to search your deck, keeping any cards that match certain keywords and discarding the rest, giving you a good chance to cycle your deck for important stuff. The surprises add a bit of fun, cause a few groans, and help you to progress your strategy; but the most important thing they do is provide much-needed interaction between players. Without such cards, NBX would be the embodiment of "multiplayer solitaire," but just the occasional chance to mess up someone else's plans elevates the whole experience to a fun and challenging... er... challenge. And that's a bit of a surprise really. I was expecting this game to be riding on it's theme - one of those games I own simply because of my love of Tim Burton's warped vision - but I'm delighted to say the game is really good. It's probably better than that. I would say that's some kind of Christmas miracle, except the real miracle is that I was able to come to that conclusion playing exclusively with the preconstructed starter decks. I have to admit, initially I was only intending to get those starter sets, because I had already heard that the decks were well-balanced and fun. That's pretty much unheard of with this type of game, which normally has horribly unbalanced starter decks that leave in just enough fun to make you want to buy some more cards from blind booster packs. Sure enough, the starter decks really are well-made. They don't feel like a sampler for the full game. They feel like the full game. You don't look at the decks and think they are sub-optimal. They contain decent combinations. They feel like decks that were preconstructed with winning the game in mind, not with showcasing the mechanisms and teasing you with possibilities you don't yet have access to. What I mean to say is, after playing, I didn't feel like I needed to buy more cards to enjoy the game. I felt like I wanted more cards because I already enjoyed the game. And so, inevitably, I bought more cards. I went back to the same eBay seller that sold me the starter decks, and I ordered a crate of booster boxes. For the record, there are 12 cards in a booster pack, 36 packs in a box, and six boxes in a crate. Yup. I bought 2,592 cards. I was hoping to get one full set of cards to keep in pristine condition, plus at least one more full set for deck construction and gaming. Considering the full set of cards is only 50 common, 50 uncommon, 38 rare, and 12 ultra-rare, it didn't seem like too much to ask. Want to know how many complete sets I got? I have hundreds and hundreds of common cards, but I could only scrape together a single set of the 12 ultra-rare cards (which dropped at the rate of three or four per box). It was an unholy mess, and an aggressively unpleasant way to distribute the cards, completely undermining the wonderful job the starter decks had done in making the game so accessible in the first instance. If you want to know more about my trials and tribulations completing the set, you can check out my video on YouTube, but for now, let's just say, I wasn't happy. NECA subsequently released a Christmas Town expansion, but I don't think it did very well. I mean, who would even try to collect them after how NECA handled the initial release? A third expansion based on the real world never saw the light of day. 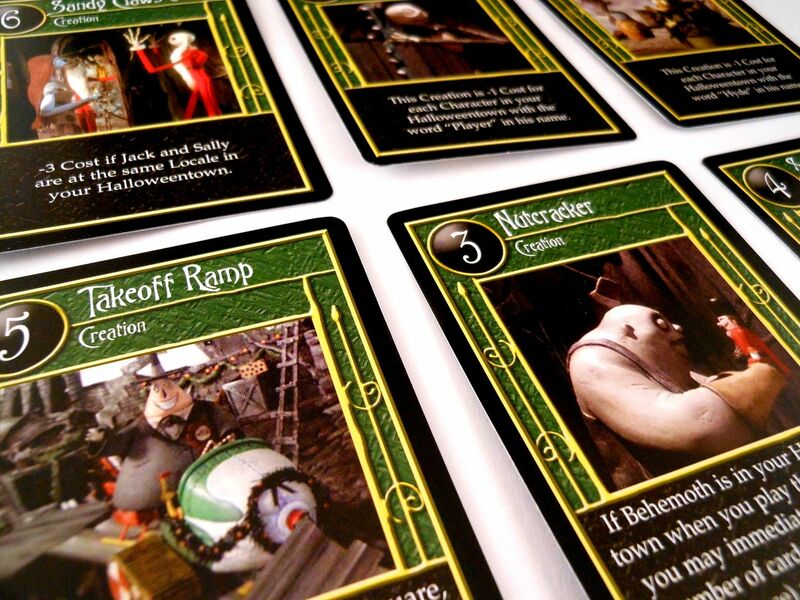 And that's Tim Burton's The Nightmare Before Christmas Trading Card Game. It's the ultimate Christmas present: Full of promise, and yet vaguely disappointing. Something beautiful that I love dearly, thinly spread over a money-making engine. 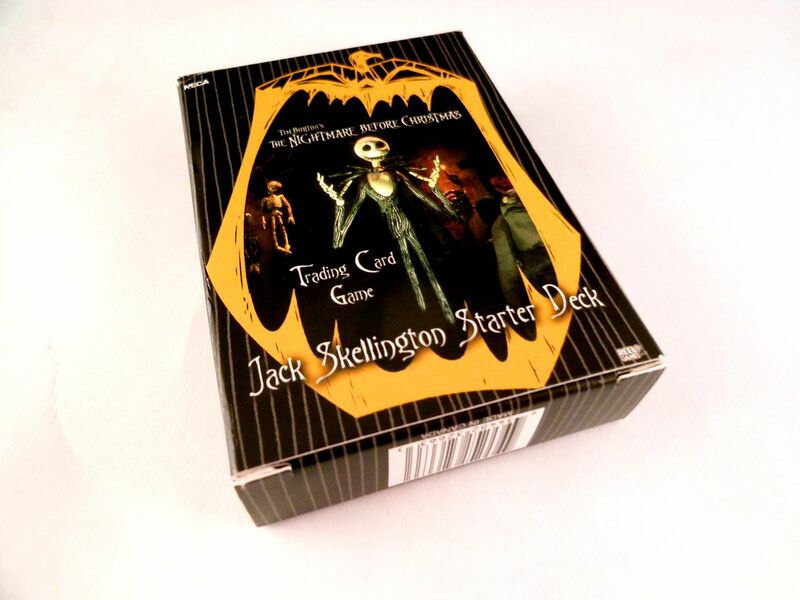 Tim Burton's The Nightmare Before Christmas Trading Card Game has been out of production for years, but it's still possible to find starter decks and booster packs on eBay. Other card games, with more consumer-friendly distributions, are available from your local games store or online retailers. I picked up a bunch of starts & boosters when the base set was released. Christmastown sadly never made it to my FLGS otherwise I would have grabbed a lot of that too. I think it's an excellent game, completely different from just about every other ccg out there. The URs may have been difficult to come by but they weren't needed to build decent decks. It really is a very cool little game, and I agree it's unlike any other CCG I've played. I'm still impressed with how good the starter decks were - something very uncommon for this sort of game.